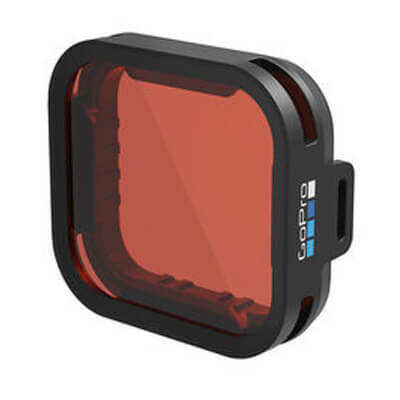 Color-correcting shallow snorkel lens for blue water or clear freshwater footage at depths of 5 to 33ft (1.5 to 10m). The Blue Water Snorkel Filter provides color correction for your HERO6 Black or HERO5 Black while capturing footage at depths of 5 to 33ft (1.5 to 10m). It’s ideal for snorkeling in blue water or clear freshwater. The filter easily presses into place on the camera for quick, tool-less installation, and can be used with or without The Frame. It’s constructed of scratch-resistant, optical-grade glass for optimal clarity. Includes a microfiber bag and tether.